First, communicating the power of educational innovations takes more than a 30 page report – it takes a good story that engages your audience and gets them to care about your innovation. How do we craft good stories for career and technical training programs? Second, industry experts are essential subject matter experts that deliver the “job-driven” curriculum in community colleges and prepares our students for success in the workforce. But frequently, being an industry expert doesn’t translate into an expert instructor. The U.S. Department of Labor’s SkillsCommons project has produced free and open tools, templates, and strategies that everyone can use to address these challenges. In this session, we will briefly review the strategies and resources, and walk through how these two tools have been applied in higher education and at the industry level. At this point, the presenters had us use the chat tool to discuss one of the topics. This was a bit awkward, as several different conversations were happening at once and I do not type very fast. Some conversations were very animated, others were not responded to quickly enough, and got pushed offscreen. After finding some posts to answer to by scrolling up to find them, and typing slowly, the conversation was actually gone already. It was a little chaotic, and probably worked better in a seated session. The presenting panel asked participants to consider and choose one of the two challenges, and to explore the SkillsCommons resources on their own devices, giving out the URL for us to explore on our own. They then began a short discussion on how to deliver the right tools, at the right time to faculty and staff to successfully overcome the challenges and increase collaboration across their participants institution. How do we craft good stories for career and technical training programs? Communicating the power of educational innovations is tough. Usually this is handed down to us in a slick sheet— this is a graphic design term for a single-page description of a new, exciting item. It isn’t an in-depth tutorial. These sheets try to sell the sexiness of the product without a major focus on the practical methods. As an instructor, we really have a dual role: We have to educate the class, but we have to capture their imaginations and impress upon them how these tools we are teaching are essential OR at least will help you in a successful career. In many cases, we have to walk a fine line: We have to explain as much as possible in an effort to clearly make the use and practicality know, but we also have to motivate students to learn to do this on their own, capturing their imaginations and encouraging them to discover the materials on their own. We love stories of practical experience where things go very right, and stories were things go very wrong, and times when we pulled a project back from the brink. being an industry expert doesn’t translate into being an expert instructor. Many community college instructors (most really, and I know because I’m one of them) are lateral-entry. Specifically, this means that we enter teaching from a job in the field, rather than entering teaching directly from school. What makes us into good instructors— lets leave behind the idea of expert just for a moment. Coming from the workplace, we’re used to business communications where we’re speaking to a group of industry experts and workers: the vocabulary is known, the audience is clear, and vision is pinpoint, and everyone is working toward a similar if not the same goal: profitability. There is no need to talk basic concepts, no need to discuss fundamentals, no need to check anyone’s work. Poor performers are corrected and/or let go, and new workers are chosen because they are the best of the pool. In most community colleges, there is no barrier for entry: anyone can enter without many basic skills in reading, writing or mathematics, etc. Basic communication skills or a determination to complete are not required to take a course. If you’re working in a marketing firm, you’re not expected to have to reread every single proposal for spelling and grammatical errors, or determining whether or not the addition of charges adds up— these come with the territory. Without the realization of change being needed, many lateral entry teachers end up being coached, and they can find that to be demoralizing and offputting, detrimental to their careers. Many lateral entry employees give their talks and discussions in matter-of-fact ways, and this doesn’t really capture the hearts and minds of our student populations. However, when sharing the stories of the client that just wouldn’t quit, the big budget issues, the project which was saved by spellchecking, the employee who was fired for procrastination, etc., students are very quickly entranced. Sharing your experiences and stories can really give extra emphasis to the materials you are bringing to bear in the classroom. Coming from an academic-only environment, many instructors also feel that they are dealing with students similar to those they’ve left behind- interested, motivated students with a clear goal in mind. Unfortunately, not all students are motivated, have goals, interested in their education, or directed. Some students need direction, goals, and commiseration. Stories relating the teacher’s experience to theirs can be really helpful and creating the connections, but stories are great for adding direction. Many students find that they “get by”. They “got by” in high school, jobs, etc., but now they are in college and they are not “getting by” anymore. Experience is a great teacher, but demonstration alongside a story of how large obstacles can be overtaken is even better. If education-based teachers focused on how they were able to complete, there would be a far greater emphasis on motivation. A teacher who discusses how their student group was formed and then split into categories might help others to do so. A teacher who tells that they “stayed up so many nights working from 8pm to the wee hours of the morning that their neighbors knew if the lights in her house were out… then the neighbors needed to go to bed too!” might encourage students to give that ongoing, continuous effort that really brings things together. Discussing how one teacher breaks down an assignment to research and write a paper can be helpful to a whole population. Share your knowledge! In why ways would storytelling benefit your college’s initiatives? What is the first story that needs to be told and to whom? Imagine your college implemented the IE2EI course with industry experts. After one year, what are the targeted outcomes. How do you celebrate? What did you hear today that you could use in the next 3 months. What are the first 3 steps toward making that a reality? These questions were nice, but the answers were really ones which should come from within. Of course, the chat exploded, and the presenters hit on major talking points. Panelists showcased an example of selecting one story and discussing it. It was a math example for real-life situations about the size of a fence perimeter. They then showed one module from the IE2EI course and the audience was asked if they had considered something like it. This was helpful to many but had little relevance to me, because we do something similar but a bit more advanced at Wake Technical Community College. There was a minor Question and Answer session. Relative to SkillsCommons IMPACTcommunities Panel, there were few questions. Most participants did not want to leave the session to view the materials. The co-presenters all ended with a brief summary of highlights and resources from each of their perspectives. Maria Fieth, M.A.2, RTC. Maria currently serves as program manager responsible for communications and community building for CSU-MERLOT SkillsCommons. During the last 26 years, Maria has worked with businesses and PK-20 educators providing guidance for refining and sustaining healthy learning and working environments and building partnerships and community among stakeholders. Maria’s background in federally funded project management provides a strong backdrop for national level accountability and performance. Her work has received honors for building exemplary educational settings and community partnerships from Kevin Jennings of the U.S. Department of Education and Auburn University among others. Maria holds a dual Master’s degree in English and in Education, a Master’s degree in Psychodynamics and certifications in Reality Therapy and from the National Institute for School Leadership. 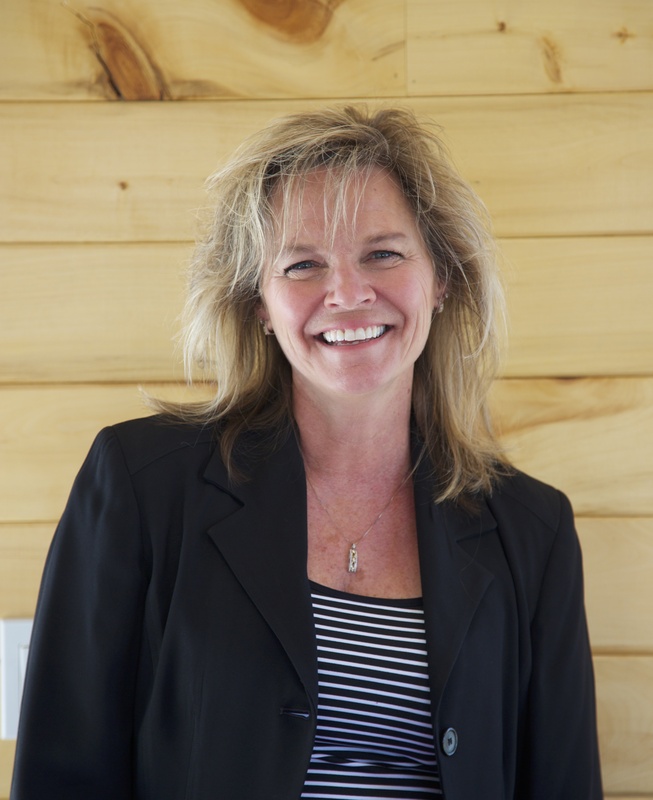 She has numerous certifications as national trainer for organizations such as Ruby Payne’s Poverty Framework, Olweus Bullying Prevention, Discovery Communication Model, and Crucial Conversations. She and her husband, Andy, have three grown sons, a lovely daughter in-law, and one beautiful grandbaby. Brenda M. Perea, Director of Educational and Workforce Strategies at Credly, brings twenty-five years of experience spanning secondary, postsecondary and workforce educational fields to help learners identify and target workforce skills not apparent in traditional credentials. She successfully led CCCS to implement a system-wide badge initiative. She believes identifying competencies is critical to establish career and educational pathways in conjunction with business and industry to ensure to post-secondary education and career training is relevant for today’s workforce. 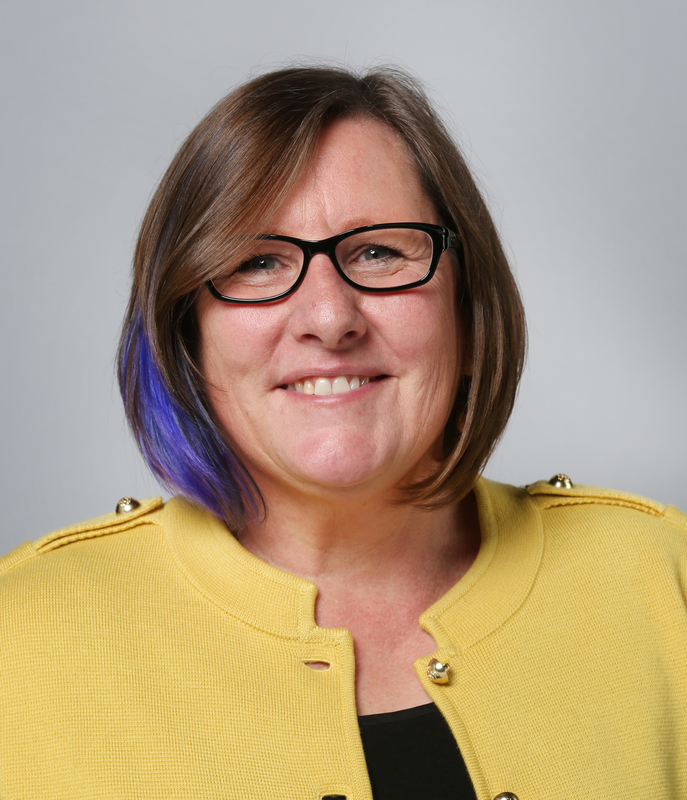 She works with the international Open Recognition Alliance and IMS Global to shape the national conversation on recognizing learning where it happens, industry and business engagement in post-secondary education and workforce credentialing. Brenda is also a SkillsCommons community Ambassador whose mission is create affordable innovations in workforce education and workforce development programs to be easily and widely adopted and adapted by teachers, learners, industries, and professional organizations. Brenda also speaks nationally on open educational resources, data analytics improving student success and digital badges. This entry was posted in Professional Development and tagged Brenda, Brenda M. Perea, Challenges, collaborative, college, communications, community, community building, community college, Community College Summit - StoryTelling and Growing Expert Instructors, Consortium, Credly, CSU, CSU-MERLOT, Director of Educational and Workforce Strategies at Credly, Educational, educational innovations, Expert, Expert Instructors, Growing, ideation, IE2EI, IMPACTcommunities, innovations, Instructors, learning, MERLOT, online, Online Learning Consortium, Perea, program manager, SkillsCommons, SkillsCommons IMPACTcommunities, Story Telling, StoryTelling, summit, U.S. Department of Labor’s SkillsCommons project, wake technical community college, Workforce Strategies. 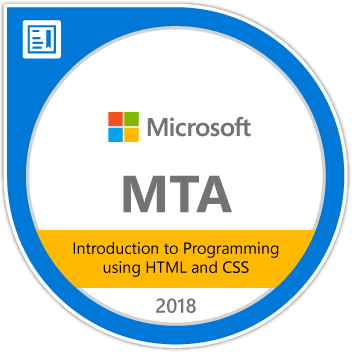 Microsoft Technology Associate (MTA) status in Introduction to Programming Using HTML and CSS Achieved! At 10:45am On 3/22/18 I attended the Certiport certification lab presented by Certiport at the 2018 NCCIA Conference located at Asheville-Buncomb Technical Community College in Asheville, NC. MTA status in Introduction to Programming Using HTML and CSS Achieved! I chose to attempt this exam because I felt I could validate the skills and knowledge to recognize and write syntactically correct HTML and CSS, structure data using HTML elements, and create and apply styles using CSS. Since I was trained on HTML in 1996 and certified with CSS in 2001, and had been working with HTML and CSS with clients for 18 years at this point, I’m familiar with their features and capabilities, and understand how to write, debug, and maintain well-formed HTML and CSS code. All in all, this test was well worth the time and effort. The materials covered had a good amount of in-depth knowledge requirement, and I was able to break through with a score in the mid 900s. It was a good challenge, and I felt it will be helpful to me to show students that the MTA exams are a fine choice to showcase their abilities. This entry was posted in Certification, Professional Development and tagged A-B Tech, asheville, asheville-buncomb, asheville-buncombe tecnical community college, buncomb, certification, certiport, community college, css, css3, dockery, doctype, html, html5, keywords, microsoft, mta, NCCIA, programming, stylesheets, svg, tyler, Tyler Dockery. Today’s faculty development keynote was opened by James Roberson, Chair of Faculty Development. After a set of brief introductions, he introduced VP Bryan Ryan, and several other key members of faculty PD staff. Dr. Stephen Scott began with his keynote with a quick breakdown of Wake Tech’s current system. In the last year, Wake Tech had over 64,000 registered students, making us the largest community college in North Carolina. We have increased our full student offerings, increasing from 67 degrees and certifications offered, to a full compliment of 231 degrees, certifications & diplomas. Dr. Scott went on to discuss the changes taking over both the industry and the United States. This economic recovery is different from others. Typically, the economic recovery and recession cycle is on a 10/11 year cycle. the determination for the economic cycle is typically based on jobs and job numbers. For most people, the number of jobs available and the % of people jobless represent 100% of the recession determination. What’s the difference between a recession and a depression? Well, the answer is relative. How do we help students face the new business models and the new job paradigms of this modern era? How can we prepare the students of today for the new jobs that are going to be created or available in 2-4 years? Many of the jobs we have today, and the degrees we offer now simply didn’t exist 10 years ago. To remain relevant, we need to constantly keep on the cutting edge and prepared for the trends and technologies of today and tomorrow. That is why we focus on value-added education and continuous improvement through professional education, professional development and applied benchmarking. We at Wake Tech have grown in size and scope to reach 100,000 students enrolled by 2020. Community college enrollment in the state is down across the board, but we have been growing. How can we continue to grow? What can we do to reach our true and best potential? Full funding over the summer would only grow our programs and student body here. We have truly been pushing STEM education, and it has really been helping us and our numbers. The process of construction is looking good, and we will begin breaking ground in Fall 2016 at our RTP campus. Dr. Stephen C. Scott is the third president in Wake Tech’s history. His personal focus is on value added education and leadership development for faculty, staff and students. This entry was posted in Professional Development and tagged bryan, Bryan Ryan, community college, dr., dr. stepehen scott, james roberson, roberson, RTP, RTP campus, ryan, scott, STEM, stephen, wake tech. 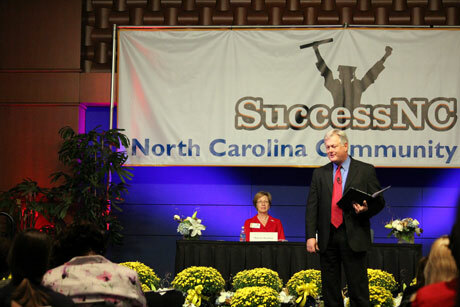 Tyler Dockery attends the NCCCS 2014 Conference Opening! Tonight’s ceremony had a session followed by a fine conference opening with a great food reception and discussion board afterward. The Opening Session was followed by a short discussion set. I joined the Capstone Roundtable lead by Roanoke-Chowan Community College. This roundtable outlined how Roanoke-Chowan community college was using their capstone courses as an opportunity to connect real-world challenges with their students. Materials involved showed a strong connection between local businesses and college students, followed by a fair amount of pre-degree hiring. Rountable discussion progressed with an effort to get feedback on how to improve their processes and moved into general discussion and recommendations from Roanoke-Chowan Community College to participants, including lessons learned, and plans for future expansion. 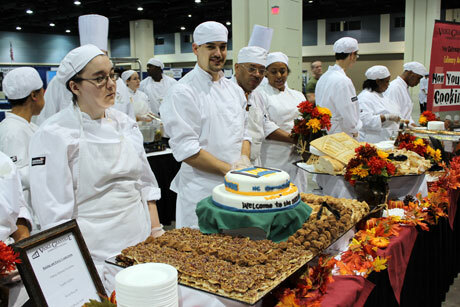 After the initial discussion was closed, we descended to the expo floor in order to taste the fine trappings of the culinary departments from several schools, to visit traveling exhibits from several community colleges, and sample some entertainment. I myself enjoyed a brief discussion with Woody Hayes and Marsha Mills, Advertising and Graphic Design instructors at Wake Tech Community College, and stayed until the gospel choir had finished their initial set. I was really looking forward to tomorrow’s sessions, and went back for a good night’s sleep. This entry was posted in Professional Development and tagged advertising, advertising and graphic design, chowan, community college, design, dockery, Graphic Design, hayes, marsha mills, mills, ncccs, ncccs conference, ncccs conference 2012, roanoke, roanoke-chowan, roanoke-chowan community college, roundtable, Tyler Dockery, wake tech, wake tech community college, woody hayes.